Full of flavor and crunch, this recipe was adapted by Danielle from Rebecca Katz’s book The Longevity Kitchen. Danielle demoed it at Brookside and at USBG in May 2014. To toast almonds: put a small skillet over a low flame and add the almonds. Toast, stirring often, until golden and nutty smelling, about 2 minutes. Transfer to a plate immediately to cool (almonds can burn easily so keep an eye on the skillet). 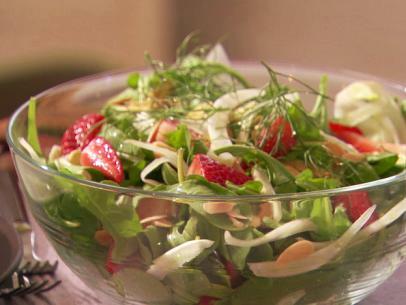 Combine the arugula, fennel, sliced strawberries and mint in a serving bowl. Toss gently to combine. Refrigerate until ready to use. Whisk together the ingredients for the dressing, drizzle over the salad and toss gently. Scatter the almonds on top and serve immediately. Serves 4. This entry was posted in Recipes from Danielle's pantry, Salads, Vegetarian and tagged ararugula, fennel, strawberry. Bookmark the permalink.